Veterinary medicine is one of the most popular and rewarding career options for animal lovers, so if you love animals, there are many reasons to pursue a career as a veterinarian. 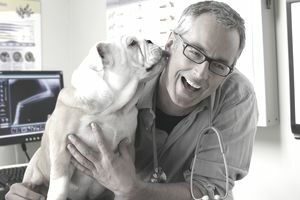 One of the greatest benefits of a career in veterinary medicine is the chance to promote the health and welfare of your patients. You also have the ability to relieve the suffering of animals that have experienced traumatic injuries or chronic illnesses. Even routine spay and neuter surgeries help the animals in your community by reducing pet overpopulation. No two days are alike for a veterinarian. You will get to examine different types of animals, see a variety of injuries and conditions, and utilize many diagnostic tools to determine the best plan of action. You never know what will come through the clinic door on any given day. Veterinary medicine is certainly one of the animal careers that can offer an excellent salary, though you do have to take into consideration all the educational costs of obtaining that coveted DVM degree. Veterinarians earn a median salary of $89,000 as of early 2019, with a salary range between $50,000 and $200,000 per year. Those with additional specialty training or board certifications can earn even higher salaries. Vets get to meet many members of the community by virtue of seeing their animals for appointments and emergencies. They also have the chance to educate and advise owners about a variety of important health issues such as spay/neuter programs and proper nutrition for their animals. Some detective work has to be done to evaluate each case, and a key trait of a veterinarian is that they enjoy this challenge. The animal obviously can’t explain what is bothering them, so you’ll have to figure things out based on the physical exam, lab tests, and owner comments. While you may start out working for an established clinic, you have the option of starting your own practice, perhaps even a mobile practice, which greatly reduces startup costs. You can also become a partner in the established clinic if they are looking to expand or if other vets are planning to retire. Most vets have a degree of flexibility in their schedules, particularly as they become more established. Veterinarians never stop learning new things. Continuing education hours are required to renew your license to practice medicine, and most vets would want to learn new techniques and innovations even if there was no official requirement. The industry constantly evolves, and it is important to keep up with the latest developments so you can provide the best possible care to your clients. Vets can also pursue board certification in a ​specialty areas, which requires a great deal of additional training and hands-on experience. You can use your veterinary background to transition into a variety of roles with other organizations, such as veterinary pharmaceutical sales companies, feed companies, wildlife agencies, laboratories, academic institutions, or the military. Corporate vets, in particular, tend to earn top dollar and work normal business hours. You don’t have to limit yourself to a traditional private practice seeing patients each day. Veterinarians have the opportunity to lead a team of animal lovers including veterinary technicians, kennel attendants, and office staff. It makes a difference when all the employees at an office enjoy what they do for a living, and in this line of work, people tend to be truly committed to helping animals. Veterinary medicine is by far the most popular “dream job” for animal lovers, and many kids start mentioning their interest in this career path at a very young age. If you have the drive, the grades, and the desire to work with animals, this may be the perfect job for you.